The reason why I gave this book a five star rating is because I like the way the elephant is understood by Erica when he goes TRONK TRONK TRONK then TROOOOOOOOOOOOOOOOOOONKED. Erica is described as a very practical girl although she is full of ideas and is very crazy. The elephant is very clever but can get extremely confused. The elephant hurt his knee while traveling from India to the UK. The whole story is about a young girl called Erica that gets an elephant from her uncle she doesn’t live with parents but now lives with an elephant! Zoo keepers try to take the elephant away from Erica, she can’t let that happen. She tries to get the elephant back but weird things happen on the way! Please read this book I would highly recommend it. I recommend Utterly Me, Clarice Bean because it was a great book to read and I couldn’t put it down. The book made it like it was real life and I’ve read it several times. In this book, some of the writing is not always in a straight line and the illustrations are great! 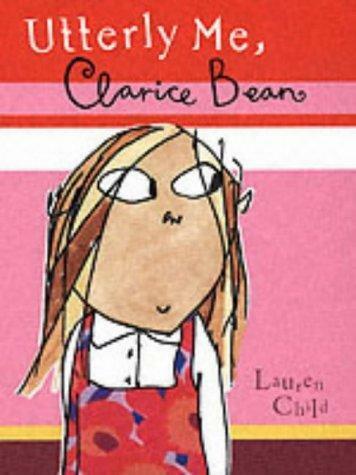 The main character is of course Clarice Bean who is a normal school girl and she is always getting in trouble. She has a moody teacher called Mrs Wilberton and she is constantly telling Clarice off for not concentrating, with her honking voice. Clarice Bean has six people in her family. Her hard-working mum, who’s always saying, “This house doesn’t clean itself you know. Who do you think does everything around here? Mr Nobody? I don’t get paid to pick up your smelly socks! If I did, I’d be a very rich woman!” etc. etc. etc. non-stop. Her dad, who is always on the phone. Her brother, Kurt, who is the oldest out of the kids, then Marcie who is always rude, then herself, Clarice. Unfortunately, she has a little brother, Minal, who is an utter nuisance and nincompoop. She has a best friend, Betty Moody and another friend Karl Wrenbury, Karl Wrenbury is the naughtiest boy in the school and gets told off at least once a day. You might enjoy this book as much as I do. If so, then get a copy and keep reading!